Oh Spring, so good to see you! Let's hang out! Day 21 of my 30X30 Remix Challenge, and this weekend I found my self keeping it simple and easy. Top knot, sundress, sunnies, market tote, and a repurposed scarf as a belt. Done & done! This is such a pretty look - you look like you're ready for a picnic! I like this! I have a dress just like it. I may need to incorporate this look into it! Love the simplicity of this outfit! You look ready for summer! 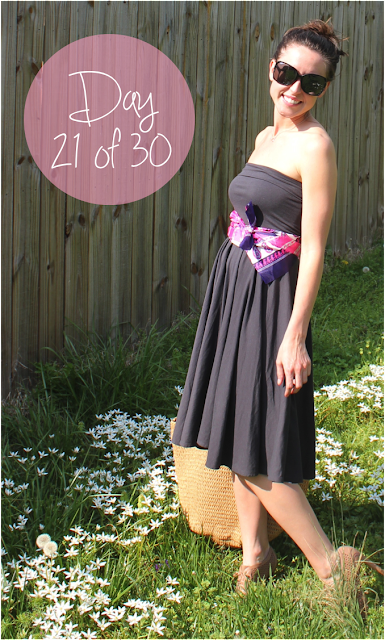 Love how you used a scarf as a belt! Why haven't I ever thought of this before!! ;) Loving the green grass and FLOWERS!! Hello, Spring!! Love the scarf as a belt!! What a cool idea!! !